Couples marrying in Newport or any of our surrounding coastal communities must apply for a marriage license at a city or town clerk&apos;s office (see resident/non-resident requirements below). 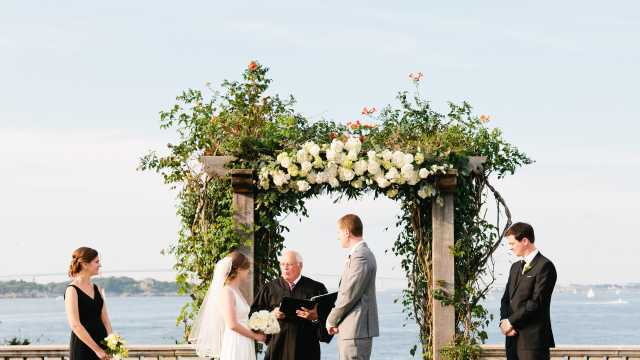 The license is valid for three months after the issuance date and the ceremony must take place in the presence of the officiant and two witnesses age 18 or older. Both people must apply for the license in person and sign the application in the presence of a city or town clerk. Please contact the city or town office where you will apply for the license to verify their identification requirements, fee and hours of operation. If both applicants live in Rhode Island, apply for the license from the city/town clerk of the residence of either applicant. The marriage license is valid in any city or town in Rhode Island and the couple may be married anywhere in Rhode Island. If only one applicant lives in Rhode Island, the license must be issued from that applicant&apos;s city/town of residence. If neither applicant lives in Rhode Island, the marriage license must be obtained at the city or town clerk&apos;s office where the ceremony will take place as the marriage license is valid only in the city or town in which it was issued. If the ceremony is performed in a city or town other than where it was issued, the validity of the marriage may be in question. Most cities and towns require certified copies of your birth certificates and a valid government issued picture ID but check with the city or town clerk where you will apply for the marriage license to verify all requirements and fees.